The MP-1 is a bit of a mystery. There's an TMC photo (below) of this unit, and it has its own Sales and Service Bulletin 105 (which I do not have a copy of), so it was clearly a TMC product. It isn't clear what this unit is or does, but it appears to have been related to the McElroy Morse Package MP-1A. Note that it is quite different, apart from its black wrinkle finish, carrying handle, and nomenclature. For example, the tubes visible in this view are octal tubes, while the tubes inside the McElroy MP-1A are all miniature types. So, what the heck is this thing? My speculation is that TMC may have re-sold an early version of the McElroy MP-1A in the time period between TMC's founding (1946) and the introduction of the MP-1A (1950 or before). I have not yet found any references to the MP-1 in the TMC drawings. If you have any information about this TMC product, please let me know! 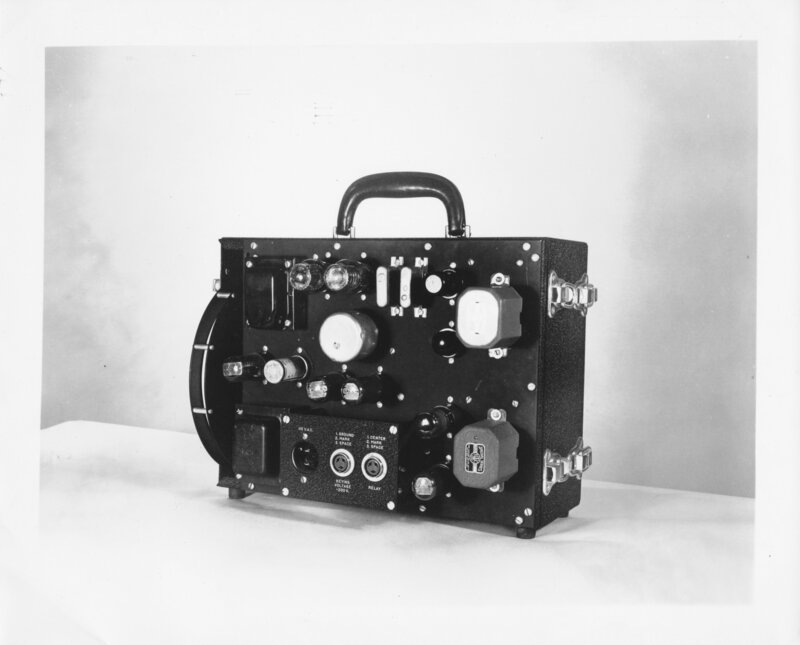 "1124.1 Morse Code Inker/Performator/Transmitter Model "Morse Package Unit type MP-1A" s/n 165. Mfg by McElroy for the Technical Materiel Corporation. Item will punch, or ink, paper tape with Morse code characters received either off-air or via a built-in polar type CW key. Unit is unused and in original as-new condition. Less manual. After minor oiling the perforator is in perfect operating condition and will punch and transmit taped messages. Inker was not tried. Very nice example of various similar items. Circa 1950." There is an example of the MP-1A in the AWA Museum, shown in the photos below. 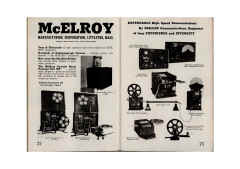 This photo shows the McElroy MP-1A front view. Another front view. In this view, one of the modules, the tape perforator, of the MP-1A is deployed. Another view of the tape perforatort. This show shows the internal components of the MP-1A. Note that the tubes are at the top of the photo and are all miniature types. "The AWA Museum just received the donation of a very nice TMC "Morse Package Unit, Model MP-1A" (actually manufactured by McElroy). 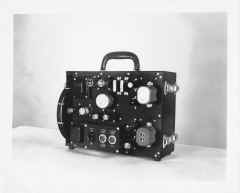 It is a small box with a carrying handle that opens up to allow the perforation of Morse tape (Wheatstone perforator), a tape reader and a tape inker (siphon recorder). Also included are patch cords, tools, & a couple of spare parts. Unit has about ten tubes (6AQ5s etc) and looks to be post WWII. The perforator folds down out of the front panel and has three keys: dot, dash & space. One of the tape rolls in the cover attaches to the side of the perforator. There is no chad catcher!"